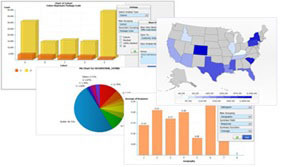 There is no question that the largest of companies are using some form of business analytics in their decision making. The question addressed in this whitepaper is should the small and medium-sized businesses (SMBs) also use analytics. In AGC’s opinion, the answer is, unequivocally, Yes! However, recent surveys indicate that the SMBs face a steep learning curve in using and benefiting from analytics. The article also provides a five question benchmarking survey to help assess a company’s level of analytical development and competency. The score from the survey can be compared to the maturity matrix provided to determine what stage the company is in. We also offer our suggestions on possible steps leading to the successful use of analytics in mastering informed decision making. While analytics may become the backbone of a company’s decision making, decisions should not be based on analytics alone.